Are you going to be happier with straighter hair? Or should you just work with what you've got? Our shared "hair issues” were the first major thing my mom and I bonded over. We would try everything: mayo masques to remove frizz, beer and egg yolks to add shine, mini sauce cans to roll our hair in and makeshift dryers to sit under. Ultimately, there was little that one could do to tame my frizzy, curly mane. The more I tried to manage it, the closer I got to simply giving up and gelling it into a bun. As I entered my teen years, we started to toy with at-home relaxers, the kind you would buy in beauty supply stores. The smell was something akin to rotten eggs and the chemicals were so strong that my eyes would burn and my scalp would get irritated and bleed. The saddest part was, those silky straight locks never lasted for more than one shampoo. By the next time I washed and blew out my hair, I’d have more frizz than ever, my hair fried from all the abuse. With time, knowledge and, well, income, I tried a lot more through the years and learned as I went. There’s so much I wish I’d known then that I know now! It seems obvious that chemical straighteners weaken hair, but companies have found a way to present these treatments as gentler than they actually are. “Most relaxers use sodium hydroxide (lye) or a close chemical cousin. Don’t be fooled by 'no lye' promises," said Victoria Wurdinger of Latest-Hairstyles.com. I didn’t know that then. I believed the boxes that said they were "safe” and conditioning. All I knew is that I wanted to look more like Kelly Taylor from "90210," and less like "Felicity." After getting that initial treatment, I felt golden, but it really just kickstarted the process of going for root touch-ups every few months. Even pros find it hard to avoid overlapping chemicals on already treated hair. Home users most certainly do. Any sort of relaxing or smoothing treatment should always be applied to the hairline last. It’s the most fragile area and often has the most “baby hairs” (i.e. breakage!) and yet people don’t consider this when applying. We often look at advertisements or images in pop culture and want the exact style we see rather than asking what products are right for our hair. I wish I had known from the beginning that I could customize my treatments. Whether you get Japanese (which is stronger) or Keratin (which is semi-permanent and shampoos out over a series of weeks), you can mix formulas based on what your hair needs. If your hair is finer in some areas, you might want to use a gentler formula so as not to cause further damage or breakage. Many people don’t know that is an option. I didn't and I had a bunch of bad experiences because of it. You may discover that there’s a certain formula that works best for you and your hair. You may want to do it regularly. Great! But if you go to various salons with various professionals, make sure the hairstylist's hot irons are not old and damaged. Old tools can burn your hair and literally pull the locks out. Speaking of tools, pay careful attention to instructions for aftercare. With most treatments, you aren’t allowed to use heat tools for at least a few days. I didn’t listen once, and thought I was making fun styles with my curling iron. My hair was so fried by the end that I spent the entire winter in hats (and tears). Real talk: Are you OK with multitextured hair? Are you ready to straighten your hair every few months or go for endless touch-ups? Do you want to be like me and embarrass your friends and loved ones by carrying shower caps in public because your frizz is so difficult to manage that you can’t even fathom the idea of getting caught in the rain? ALL FOR PERMANENT STRAIGHTENING. This is your new life. It may be fine with you. It’s my normal. I’ve been doing this for nearly two decades. Sheesh, I wish I had known what I was getting into, though. 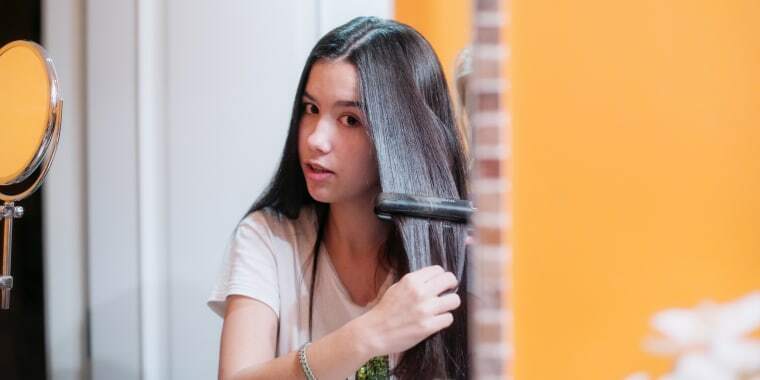 If it's your first time getting your hair permanently straightened, ask your stylist to treat a sample piece first so you can test how your mane reacts to the chemicals. “It's a gamble. Hair may take too well or not at all, [it] just depends on the actual chemical and the history of your hair,” said Tippi Shorter, artistic director for textured hair at Aveda Global. So, it’s rough. Worst case, you destroy your hair. Best case, your life will end up revolving around your hair. True story: I got color for the first time a few days before my brother’s bar mitzvah. I have naturally platinum blonde hair (what was I thinking? ), but I really wanted lowlights to add dimension. Pair that with a recent at-home straightening experiment that I neglected to tell the stylist about (a big no-no, but I was young and stupid) and I have green, frizzy hair in all my brother’s bar mitzvah photos. Make sure you always disclose your hair history with any professional you go to. “Women who get spur-of-the-moment cuts after a straightening ... end up with a 'chemical cut' as a result,” Shorter said. And be aware when it comes to color. “With the newer and more popular non-formaldehyde keratin treatments or semi-permanent hair straighteners, color should be done after the treatment,” said Henri Borday, master stylist at Mizu New York salon and director of education at Cezanne. If a stylist is using a formaldehyde-based straightener, however, color should be done beforehand. Nowadays, you’ll probably find most formulas are formaldehyde free since they are better for your health. Sadly, they don’t work nearly as well on your hair. I would love to wear my hair curly now, but natural curls are no longer an option for me. I have the aforementioned mixed-texture hair. Do you love wearing your hair straight sometimes, and curly others? Sure, you can always recreate that with heat tools, but if you want the option to wear your natural curls, an aggressive-straightening treatment isn't right for you. If you want more options and more body, consider going with something semi-permanent, like the Keratin treatment instead. If you'd like your natural texture to gradually return, Keratin (often known as Brazilian) is the best choice for you. Japanese is way more of a commitment, but has much more permanent results. That can be good or bad based on what you want. Truthfully, you may not want to get a straightening treatment at all. Chemicals are not your only option, which is something I wish I understood before I did so much to my hair that I need extensions to regain my formerly coveted length and volume. There are a lot of non-permanent ways to reduce frizz, like using deep-conditioning treatments or frizz-controlling shampoos and conditioners. The results won't be as dramatic, but you’ll save time, money and the health of your hair. Whenever we embark on anything new — love, a low-carb diet, a hairstyle change — we’re going outside of our comfort zone. That may be awesome, but you should ask yourself a few big picture questions before you make this sort of commitment (especially since our greatest relationship may be with our hair). Are you ready to take on the extra work? Are you going to be happier with straighter hair? Or should you just work with what you've got? This is a decision I made for myself, but it remains personal for each woman to decide if they're ready to take the straight-hair plunge. This article was originally published on Jan. 26, 2015 on TODAY.com.